Friends love to share their favorite things with others and Friends of the Old Courthouse is now offering to share their favorite building with all interested parties. Free public tours will be offered at the Old McHenry County Courthouse, 101 N. Johnson Street, on the Woodstock Square from 10am – 1pm on the First Saturday of each month in 2019. The history and usage of the 1857 landmark building, and the adjacent 1887 Sheriff’s House, as well as the many architectural and design features not typically available for viewing, will be explained in detail by trained docents. Tours take approximately thirty minutes. Friends of the Old Courthouse is dedicated to creating awareness and appreciation for the historic importance and aesthetic beauty of the Old McHenry County Courthouse and Sheriff’s House, and assisting the City of Woodstock in raising funds for the buildings’ restoration and repurposing. 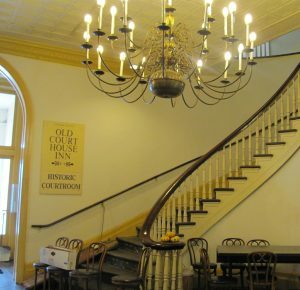 Donations to the buildings’ restoration, memberships to Friends of the Old Courthouse, or purchase of a variety of related creative merchandise, are welcomed, on site at the building, or through website or Facebook listings: www.friendsoftheoldcourthouse.org.